If you’ve ever venture over to the information bulletin board in Dinoland U.S.A., you’ve seen the wacky results of interns having too much access to paper and pens. One piece in particular that may have caught your eye is the hand drawn map of the area by Jenny Weinstein. If you examine the map closely, it may look a little outdated to you. There is not Chester and Hester’s Dion-Rama and in its place you find the Dinosaur Jubilee and the Fossil Preparation Lab. These two areas were overlooked or passed through quickly by the average guests, but offered a prehistoric world of treasures. Let’s start with the Fossil Preparation Lab. In this area scientists were hard at work preparing the most complete Tyrannosaurus rex specimen ever found. This preparation included removing rock and sediment from the bones themselves and getting them ready for casts to be made. The site at Disney’s Animal Kingdom was one of two laps working on Sue. The other could be found in the Field Museum in Chicago. Once all the pieces were ready, and the casts made, Sue took up residence in the Field Museum and now travels the world. One of the cast models was erected right outside of Dinosaur. You can still see Sue frozen in time as she charges towards the front doors of the Dino Institute. The Dinosaur Jubilee was a much larger structure and housed many other dinosaur related activities. 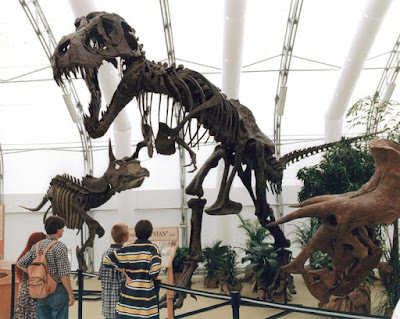 Guests could touch casts of a Triceratops’ (my favorite dinosaur) femur, get up close and personal with a tyrannosaurus rex’s skull, and even examine the fossilized victims from the guts of a dinosaur predator. Hopefully, guests visited this area after lunch, and not before. In addition to the hands-on exhibits, the Cast Members portraying the student interns would give zany tours of the Jubilee and point guests in the direction of more dino-sized fun through Dinoland. These two specimens of dinosaur edutainment would shutter by end of the year 2000; one because the fossil preparation work had been completed, the other so that Dino-Rama had plenty of space for its carnival attractions. These two sections of Dinoland U.S.A. had a lot to do with engaging guests with real world aspects of the dinosaur experience, and likely unearthed a budding paleontologist or two. I think there was something very valuable to both of these attractions and would love to see them come back in some form or another. Heck, I even here that there’s a little movie about dinosaurs in a theme park coming to the big screen this weekend. Maybe now is the perfect time to put the dinosaurs back in Dinoland U.S.A.!